People are often shocked when I tell them I'm hoping for the coldest possible temperatures when visiting Yellowstone National Park in Winter. They remain wide-eyed and shivering as I continue with descriptions of ice crystals, foggy atmospheres and the beauty associated with cold. Not that Yellowstone isn't beautiful when it's warmer, it's just that we rarely see the formations associated with real cold anymore. I miss those formations so I reminisce while my listener's chattering teeth go unnoticed. Below are two photos of the same location at very different temperatures to illustrate my point. Taken on February 13. Temperatures were in the teens overnight and about 36°F at the time of this photo. It shows the microbiological mats and dead saplings of a hot spring outflow. Temperatures are too warm to form many ice crystals or create an ice fog so we see more of the changes hotsprings create in the landscape. This image of the same location taken on February 6 has a totally different feel. Overnight temperatures dipped to -33°F and hovered around -25°F at the time of the photo. Ice fog limits visibility and the dead saplings seen in the image above are now 'Snow-ghosts' covered in rime frost. I'm not saying that one view is better than the other. Nor am I encouraging visitors to come only when it's really cold. 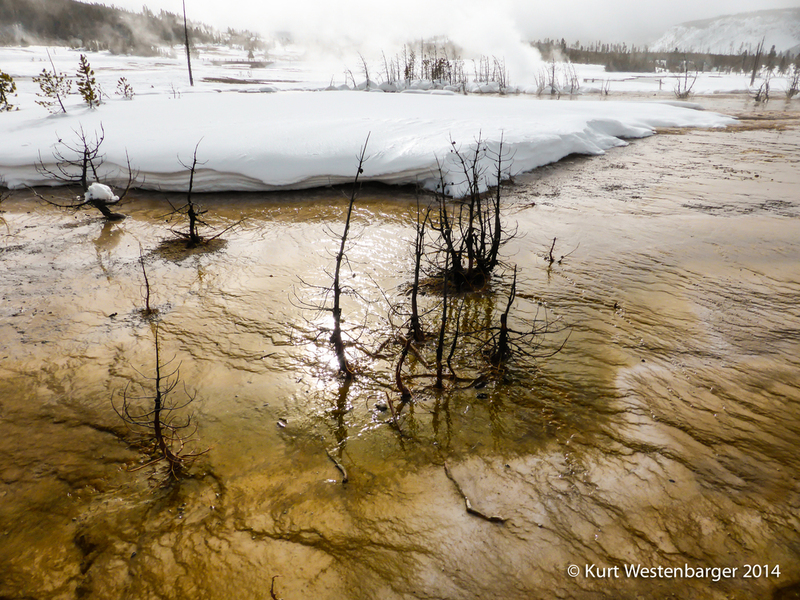 The best time to visit Yellowstone, or any National Park, is when you have the time available. I am saying that beauty comes in many forms at any temperature, in any weather. Only those brave enough and prepared enough to venture into the weather will have the opportunity to see that beauty for themselves. Never let the weather keep you indoors.